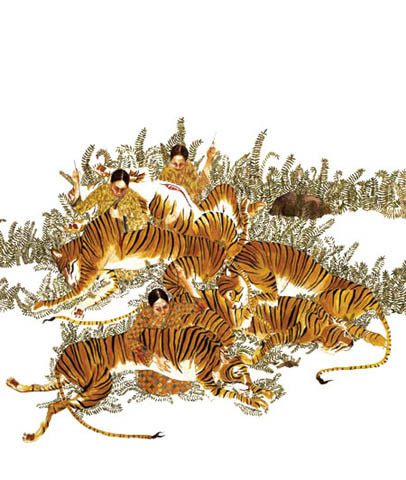 A master seamstress and her sister travel to Malaysia to swen up the torn backs of tigers. And like usual it was the way she said it. In that gentle voice that had a back to it. Here’s to probably meaningless allegories. I loved this crazy story. It’s got a sneaky calm soundtrack to it, an inner peace that never recedes, even when the story takes bleak or bizarre turns. The final gesture feels right while not speaking its meaning outright. What I mean is, I have no idea why most of what happens happens, but I accept it. Revelations are for fiction. Sewing tigers is truth. Here is a link to the painting by Amy Cutler that inspired this story. And here‘s a link to Aimee Bender’s web page. I just read this and loved it. The sisters are so interesting and real. And I try to have tigers with their skin torn in all of my stories. I also love this story. Aimee was my professor for two writing workshops in undergrad. She’s amazing! This is an amazing story, I wish it was a book. I read it for my AP reading class as a way to spot the metaphors in literature and I definitely found this to be one of my favorites. This is a great learning tool as well as a touching but eerie story that I hope many people will enjoy. I haven’t read much by Aimee Bender but if all her writing is like this, then she must be good. If she had a book I would definitely buy it.